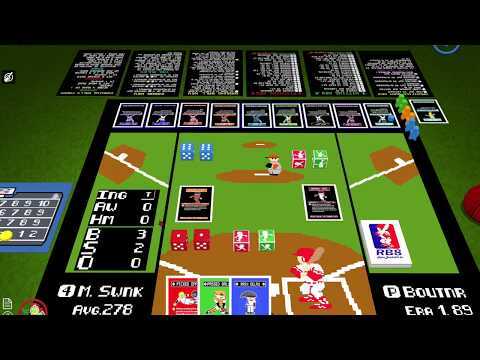 Remember the good old days of 8-bit video game Baseball? Watching those amazing 8-bit fireworks shoot off as you round the bases after that big Home Run. Things were just simpler it seemed. Now you can relive that nostalgia all over again in RB8 Retro Baseball 8-bit the Board Game. RB8 is a real Baseball Simulation brought to you in the retro look of a classic 8-bit experience. Play with one of the 16 complete teams out of the box or draft and build your team based on a point value player system with custom player cards. Will you build your team with big sluggers, dominant pitching, tough defenders, speedsters, or a well-balanced machine? The choice is yours as you get to manage and make the strategic choices. RB8 features a custom draw deck called Rally Cards with random events that happen during a baseball game, as the team manager you must decide when to strategically use them. You have full control of your team. Make the big manager decisions that can influence the game. 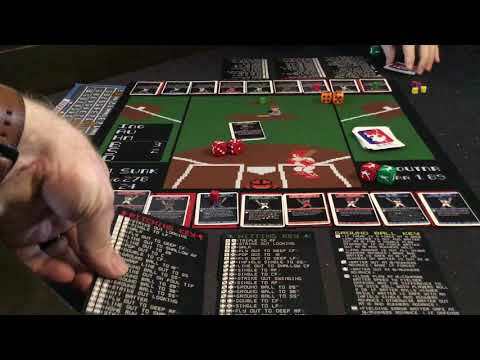 RB8 also features player cards with ratings and special abilities, two six-sided dice, special custom pitcher and batter control dice, baseball field board, batter and runner markers, scoreboard with markers, and your dice key cards. RB8 Retro Baseball is Played over the course of 9 innings in a single game or a best of series. On a turn both Pitcher and Batter will compare their ratings factoring in any special abilities and roll off to see who will get control of the at bat. This is called the “On Deck Phase”. Whoever rolls higher factoring in all special abilities will try to maintain control by rolling their custom Pitcher or Batter die. If they maintain control they will then roll dice and compare the result with their respective key to find out the results of the at bat. Players can also decide to play Rally Cards which could also affect the outcome of the play. Whether you’re a fan of baseball, board games, or both you’re going to love the feel and excitement of reliving the good old days in RB8 Retro Baseball! Will you have what it takes to manage your team to victory?